As the very first tech conference in Kosovo and beyond, DOKU:TECH continued its tech-related influence in the neighboring countries of Albania and Macedonia. 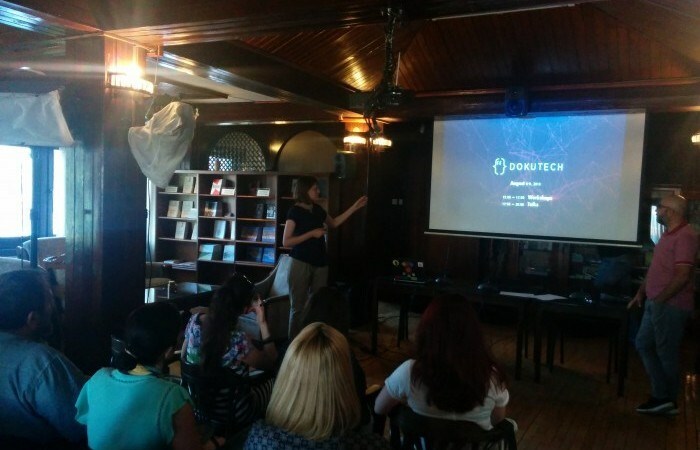 During the past days, two open house presentations were held in Tirana, Albania, and Skopje, Macedonia, where participants had the chance to acquire essential information on the main details of DOKU:TECH. Organized in an informal manner, the interaction in between the audience and the organizers was boosted by a presentation that took the form of a friendly discussion. It is important to note that not only tech enthusiasts, but also individuals from various backgrounds were present during these open houses, which complies with DOKU:TECH’s openness to everyone. The participants were attracted by the renowned and inspirational speakers, exciting workshops, and a majestic city, which all offer a delightful experience. DOKU:TECH convenes the brightest minds of the next-generation to explore the emerging technology, open knowledge and innovation of the tech around the world. Taking place in the ancient city of Prizren, Kosovo on the 8th and 9th of August, DOKU:TECH will bring together the world’s top thinkers in a venue in Kosovo. The two-day conference will be filled with inspirational talks, discussions, workshops, music, parties and more. It offers a unique opportunity for participants to engage, listen, participate, and challenge speakers during talks throughout the programme. — If you’d like to stay up to date on information relating to DOKU:TECH speakers, follow the conference social media channels: Facebook, Twitter, Instagram.